« SWLA exhibition in Aberlady and Sasha Dugdale’s “Joy”. Last week, here in the UK we had what the media were calling “The Beast from the East” (good photos). We have not had sustained snowfall here for about 8 years and the difference this time was that the wind chill was often between -6 and -10 degrees. 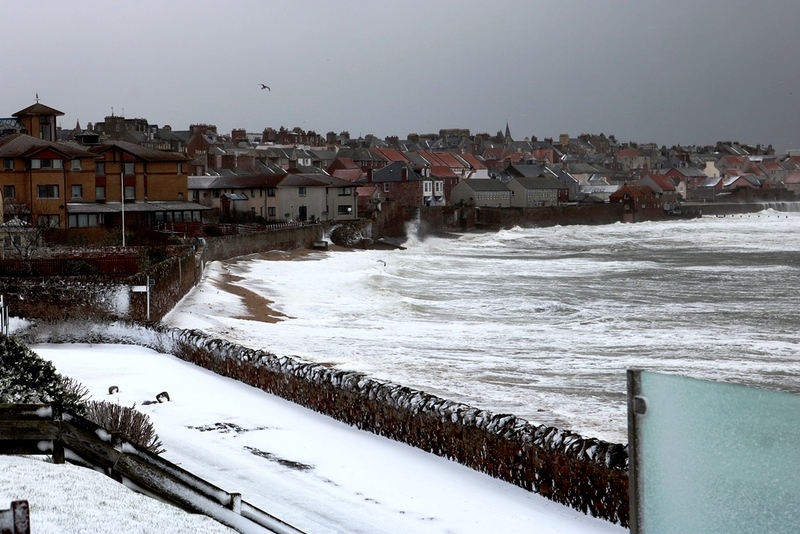 Around Dunbar, many roads were blocked and delivery lorries could not get through, resulting in a complete absence of milk and bread in the town. Interestingly, from a social point of view, the snow meant that people were not driving their cars, so there was an increase in the number of people walking to the local shops, as opposed to driving to the large supermarket on the edge of town. There was also more social interaction between people walking around, with older people commenting that this was what the High Street used to be like before nearly everybody had a car. My own research into shopping in Dunbar in the 1950s involves interviewing people and many in their 80s and 90s remembered shopping as being – for women mainly – a walking experience. One common misapprehension was that this Siberian type weather was not caused by global warming i.e. global warming was interpreted as the world getting warmer. The fact was that temperatures at the North Pole were above freezing and the cumulative effect of this, plus the direction of the Jet Stream, made it much colder here than normal. From our back door, the scene looked like this. 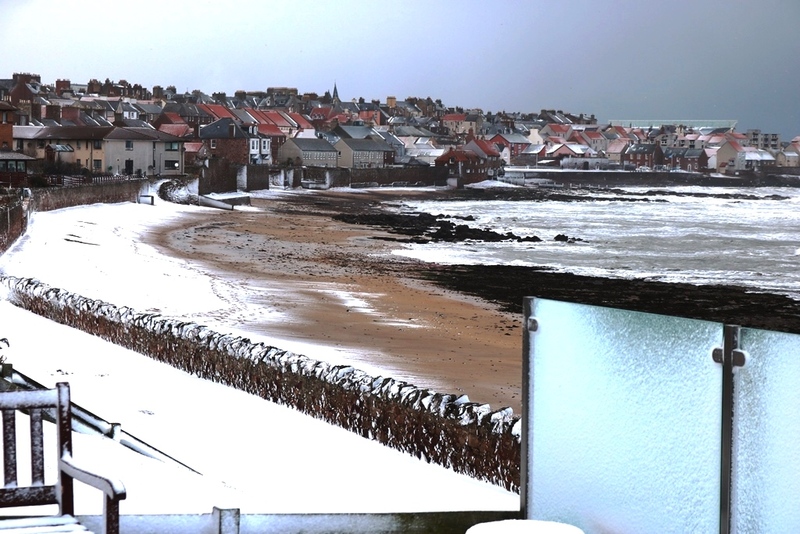 You can see that the beach is half covered in snow at this moment, but look at the roofs of the houses. The wind was so strong that the snow was continually swept off the roofs. Half an hour later and most of the snow on the beach had been blown away. The sand reappeared and there was only about a yard of snow near the walls. Then the tide came in and what a tide it was. In the photo below, you can see, on the right hand side, the waves crashing over the main wall of Dunbar Harbour in spectacular fashion. This particular wave therefore leapt perhaps 70 feet above sea level. On the left, you can see another leap of spray, this time on to the wall of the East beach. The tide ripped along the side of the wall, covering the road with water. It was mesmerising to watch. The next photo shows the incoming tide meeting the remains of the snow on the beach. The photo does not do justice to the tremendous strength and noise of the incoming tide. You can hear tide’s roaring on a wee video I made. It’s unedited and a bit shaky, as I get used to my new camera but you’ll get the (ahem) drift. I’ve just finished reading one of the most original and enthralling novels that I’ve come across for a good while. 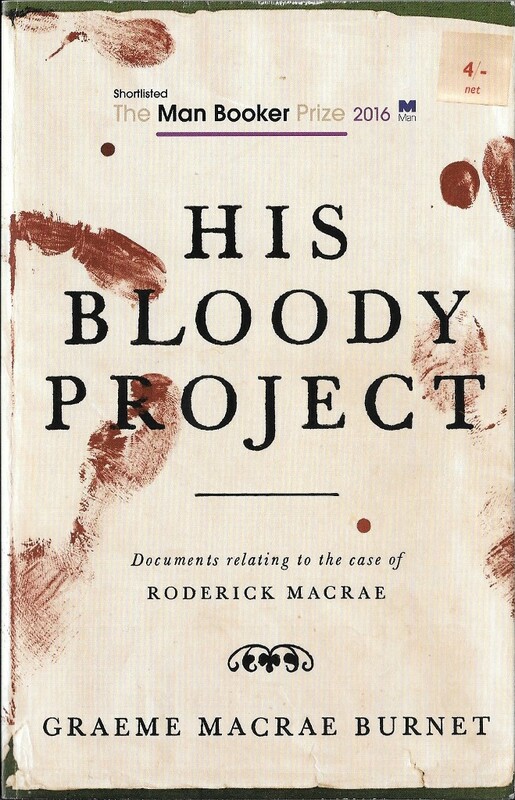 Graeme Macrae Burnet’s novel, entitled His Bloody Project is rightly described as “fiendishly readable” by The Guardian reviewer. The book has the appearance of a true crime story, as it purports to be based on 19th century documents found in the Scottish highlands. The main “document” is a lengthy confession by Roddy Macrae, 17 years old, that he killed 3 people in the little village of Culduie – a real place. However, no actual murder was committed there in 1869. The novel gives a fascinating insight to the hard lives of the crofters at this time and Roddy’s confession is littered with local words, for which the author provides a glossary – another sign that this may be a “real” crime story. Words such as croman and flaughter are used for tools used by crofters. Another telling social aspect of the novel is the attitude of some people, such as the local minister and the Edinburgh reporter at Roddy Macrae’s trial, to the crofters who are seen as uncivilised and prone to violence. The book is neatly divided up into eye-witness accounts, the confession, a section on contemporary views of insanity, the trial and an epilogue. What we see early on is that there are a number of unreliable narrators, including young Macrae. As one reviewer noted, this is not a crime novel, but a novel with a crime as its centrepiece. It’s very well written and a compulsive read. Buy it. This entry was posted on March 9, 2018 at 5:26 am and is filed under beaches, crime fiction, Dunbar, harbours, history, literature, local history, New books, novels, Reading, Sea, Winter. You can follow any responses to this entry through the RSS 2.0 feed. You can leave a response, or trackback from your own site. I agree with you about His Bloody Project: engrossing and felt so real.